Blackhawks are back to work after advancing to the Western Conference FInals. 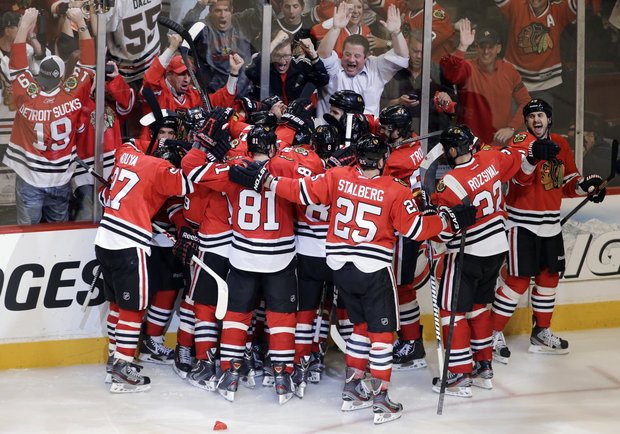 The Blackhawks bandwagon is welcoming any and all fans that want to join the playoff party. Just think, one week ago today, the Hawks were down three games to one to Detroit. Now the Chicago hockey team is on the eve of opening the Western Conference Final after grabbing one of the most exciting Game 7 in the team’s history. Brent Seabrook nailing his shot past Red Wing goalie Jimmy Howard in the 2-1 overtime is just a memory It&apos;s time to take on the Los Angeles Kings. Be prepared for back-to-back playoff games Saturday at 4 p.m. and Sunday at 7 p.m. at the United Center. The Hawks hope to maintain home-ice advantage with this odd schedule. During the compact 48 game regular season, they had 10 back-to-back game scenarios. The Blackhawks had good success, only dropping 2 of the 20 games and no consecutive losses. The Kings played seven 2-game sets; they lost 5 games. In fact, their final back-to-back in late April resulted in two losses. The NHL decided to squeeze these games together because of the Rolling Stones playing tonight and again on Monday at the United Center. The breaking down of the stage and setting up the ice has made some busy activity for the band’s stagehands and hockey crew. The league obviously wanted to take advantage of having these games on the weekend. We’ll see if this will help or hurt the Blackhawks. You know: "You can’t always get what you want." The Hawks would love to recreate the season opener, where they went into LA and downed the last year&apos;s NHL champs 5-2. The Blackhawks won two of the three meetings this season. The Kings are a tough, physical team and have the reigning Conn Smythe winner, goalie Jonathan Quick. The Kings have had trouble scoring this post season. They are only averaging two goals a game in the playoffs. The road has been a real problem for Los Angeles too. They have tallied just eight times in six games in the playoffs. The Blackhawks hope their speed and scoring ability can prevail. But Quick is truly the cream of the crop between the pipes. There are a few familiar faces on the Kings roster: Colin Fraser was a member of the Hawks 2009-2010 Championship team. And of course, LA head coach Darryl Sutter played his whole career in Chicago. Sutter coached the Hawks for three years 1992-1995 (strike shorten season). He may want to win this series more than anyone. Tickets are only available through Ticketmaster today after noon. There have been big concerns about the counterfeit tickets that have been sold around the United Center. Don&apos;t get burned buying fake tickets. This may sound strange, but the Blackhawks should thank the Red Wings. The Hawks had coasted the regular season and the first playoff round. The hard fought seven game series with their arch rivals may have brought out the tenacity the Hawks need as they move forward. The hitting and grabbing that went on with Detroit may be what the Hawks needed to toughen them up for the Kings. Sometimes adversity brings back focus. If there is one area that would be nice to see the Blackhawks get on track, it&apos;s the power play. They only had one game where it worked. They better improve or it may come back to haunt them. The Blackhawks are halfway to winning the Cup. It doesn’t get any easier from here.